Recoil Buffers™ eliminate the slide from directly impacting the frame. This repeated impact batters the frame where the two parts come into contact. Inserting a Recoil Buffer™ between the recoil spring and the slide, stops this battering. Each time the action is worked or the weapon is fired the buffer comes into contact with the frame, not the metal slide. Installation of the Recoil Buffer™ will result in reduced felt recoil, enhanced muzzle control and a longer service life. Reduces Recoil & Improves Muzzle Stability! Those who install Recoil Buffers™ into their firearm will not only be protecting their investment by prolonging its service life, but they will also find that the recoil is reduced and muzzle stability is increased. In fact, Recoil Buffers™ can do this for any gun! They work so well that many people believe they should be installed in all guns by their manufacturers. Unfortunately, this is not yet the case. So, until that time comes, make sure your weapon functions as well as it possibly can! 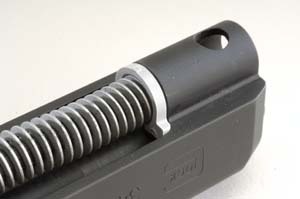 In most firearms the Recoil Buffer™ is simply placed against the inside of the slide (or bolt) where the front of the recoil spring normally rests. The Recoil Buffer™ is molded to mate perfectly with the contours of the slide. Shortly after Shot Show 2018, most buffers became available in 4-packs. Why, you ask? Buffers don't last forever. They get beat up, or simply dry out over time. Either way, they eventually need to be replaced. I plan on replacing them once a year … or sooner on my competition guns that regularly see a high round count. For instance, my .38 Super USPSA Open Class gun gets a new buffer about every 1000 to 1500 rounds. Recoil Buffer™ for your firearm in the list below. Note: These products can not be shipped outside the United States in accordance with International Traffic in Arms Regulations (ITAR). Glock Recoil Buffer featured in photo.